Working at home, I try not to miss Oprah when Dr. Oz makes an appearance, usually it’s a Tuesday and usually I’m procrastinating. 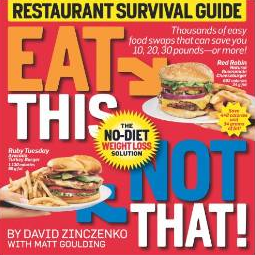 Last week Dr. Oz and David Zinczenko, editor-in-chief of Men’s Health magazine were helping overweight teens better understand calories, fat, how much one needs to eat, serving size, etc. Safe to say, it was a good lesson for us grown-ups too. Mid-way thru the program the doctors gave Oprah and the audience a quiz comparing two foods/meals, many of which are in Zinczenko’s new book,Eat This Not That For Kids. Which of the two meals/foods below they asked are healthier based on calorie, fat and sugar content. Guess what? Most of the audience, including moi, failed miserably. 1. Turkey bacon or regular bacon? Answer: Regular bacon. Both turkey bacon and regular have the same amount of calories and fat, but turkey bacon has a ton more sodium. Why? To make it taste like regular bacon! 2. A multi-grain bagel with low fat cream cheese or a glazed donut? Answer: Glazed donut. The multi-grain bagel and cream cheese have 500 calories compared to the donut’s 180 calories. And don’t be fooled — the multi-grain bagel is refined carbohydrate. Just because it’s got a variety of grains doesn’t mean they’re whole grains, and when it comes to bagels, they’re not. 3. Bacon and eggs or French Toast sticks? Answer: Bacon and eggs. It’s got 250 calories compared to the toast sticks 400 calories! Enough to say, even when you think you’re pretty smart about eating healthy, you can still be fooled. Zinczenko’s book has many more of these shocking food comparisons and I think it’s just as apt we adults learn this as kids. One of the few questions I actually answered correctly is don’t skip breakfast! Most people who do consume 450 more calories/day.